St. Peter said to Jesus, "You are the Messiah, the Son of the living God." Later he said three times, "I do not know this man." Like Peter, we have high and low points in our lives. When people are at a low point we must never write them off. Jesus knew that Peter wasn't perfect. He recognised his strengths and trusted him with the responsibility of leadership. Jesus gives us the example. Look for the good in people and try to bring it out”. How are Older People (65+) faring in Communities? This is the focus of the latest NZCCSS Vulnerability Report. The story for this edition highlights the important role played by homeownership, the universal superannuation payment and state funded supports to keep older people out of the worst of poverty. “We see the universal superannuation payment has been a success in keeping older people out of the worst of poverty, and that this model has merit for a number of vulnerable groups, including 285,000 children living in poverty” said Trevor McGlinchey, Executive Officer of the New Zealand Council of Christian Social Services (NZCCSS). “However, this also means any change to Government policy on superannuation and other state supports, including state housing, will have a direct impact on a large group of older people who are highly dependent on superannuation as their main source of income”. Read the full report and media release here. Ngaire Button (Maori Party), Gordon Copeland (Conservatives), Chris Finlayson (National), Mataroa Paroro (New Zealand First), Grant Robertson (Labour), James Shaw (Greens), Ariana Paretutanganui-Tamati (Internet Mana). The exciting conference Social Justice in Communities is not far away. This thought provoking Conference focusing on place-making, supporting communities in crisis and building socially just communities is being jointly hosted by New Zealand Council of Christian Social Services and Community Networks Aotearoa. The last day of this Christchurch based conference is the Friday before Labour weekend - so register now and book you flights early so that you are not hit by the high cost of holiday period travel! Or stay and enjoy Christchurch and Canterbury over the long weekend. Find out what New Zealand’s growing gap between the rich and the rest means for you. 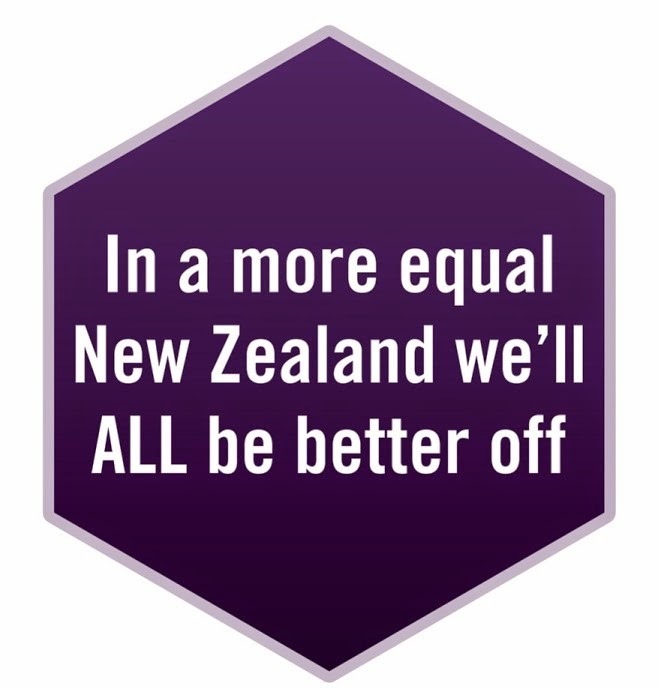 Answer two questions in this Inequality Calculator to find out how much you earn compared to everyone else – and how much better (or worse) off you’d be in a more equal New Zealand. The project, a collaboration by data journalist Keith Ng, journalist Max Rashbrooke and Matthew Bartlett from the NZ Council of Christian Social Services, has caused an online sensation, reaching 100,000 hits in one week! Check out the latest interactive infographic on Closer Together: Whakatata Mai and find out where you fit in inequality equation. Do you need information about how, when, where to vote? Go to the Electoral Commission website for all you need to know, including how to make a special vote and to vote early. If you missed Trevor McGlinchey, Max Rashbrooke and Paul Barber’s presentation to the Fabien Society ‘Building Equality: Ideas and Options’, the slides are available on the Fabien New Zealand website under publications. The Equality Network is talking Education and has drafted key messages that help to link statements about education link back to equality in Aotearoa New Zealand. · Supporting high-quality early childhood education. As part of Social Justice Week this year (September 14-20), Caritas is providing examples through video of how different communities are practicing principles of Catholic social teaching in daily life. Seven of the principles are brought to life through video:human dignity; solidarity; subsidiarity; stewardship; common good; participation; and preferential option for the poor. Archbishop John Dew’s recent article reminds us that despite recent scandals in the beehive, the majority of politicians across the political spectrum ‘are people of integrity and good will’ who are driven by a commitment to serve the people of New Zealand. “The media would also do us a service if they could help restore some faith in our political institutions by highlighting the best of our parliamentary institutions”. Tui Motu [September 2014 edition] offers up more on principal values for voting Christians: 1)the gift of community 2) the dignity of each and every New Zealander, and not just the privileged few, and 3) mercy and compassion. This edition is packed full of thoughtful articles, including one by Chris Nichol and Max Rashbrooke “Poverty, Inequality, the bible and the election”, and a lovely piece by Mike Riddell How to vote? And much more. Well worth a read! September 19th marks the 121st anniversary of women’s suffrage in New Zealand but according to Catriona MacLennan there has been little progress on genuine equality for women. The lack of data on CPI changes across different household groups, particularly those living on low household incomes, has long been the source of vexation to many researchers. But no more! Following an independent review of the CPI (May 2013 ) Decision on 2013 CPI Advisory Committee recommendations Statistics New Zealand has announced it will produce eight new household living-costs price indexes: Beneficiaries, Income groups, Māori and superannuitants. Data will be available late 2015. NZCCSS Looks forward to analysing this data for the Vulnerability Report when it is made available. Can An Open Government Plan Happen in Secret? Public Good Aotearoa say no and many would agree.. It seems the State Services Commission has already sent NZ’s Open Government Action Plan to the International Open Government Partnership without consulting with community groups. If it looks like a duck, walks like a duck and quacks like a duck then it probably is a duck! A closed government plan is probably a more apt description. If you want to find out more about this issue go to the Public Good website and watch (via videolink) a recent presentation by Dr Michael Macaulay on the Open Government Partnership, and if you want a real eye opener watch Prof Jane Kelsey’s presentation on Trade Agreements and Democracy. The third Children’s Team has been established in the Horowhenua and Otaki region. Jacqui Moynihan has been announced as the new Children’s Team Director for this region. Seven more Children’s teams will be established by the end of June 2015. The Marlborough team is scheduled for November 2014 and Hamilton will follow early in the New Year. More information about what this means for this region is available in Frequently Asked Questions. All good work but we still need to keep our eye on the ball in terms of what will happens to children deemed below the threshold for fast-tracked services. Will they receive access to much needed supports and services? Are we trading one group of vulnerable children for another? There are still many questions to be worked through. It’s ten years since the publication of “Old, Cold and Costly” by Presbyterian Support Otago that advocated for the introduction of rental housing warrant of fitness. Out in the Cold is a follow-up report that includes an update to the original 2004 survey. “Changes for the better have included a greater emphasis on insulation and a growing acceptance of some form of warrant of fitness for rental housing” says Gillian Bremmer, Chief Executive. However, “Many still pay significantly more than 30% of their income on rent for housing that is neither well insulated nor maintained”. It seems there is much more to be done in regions outside of Auckland and Christchurch. Read the full report here. Along with other community social services providers community mental health providers are struggling with the under-resourcing of their services. This is an ongoing problem with providers in many different service delivery areas not having any inflation adjustment to their contracts – some for up to 7 years. The radio link explains how this issue is impacting on community mental health. If you are developing or considering a collaborative project or merger, see how the Working Together More Fund (WTMF) might assist. Download the brochure or visit workingtogether.org.nz for criteria and case studies. Applications for the third and final 2014 funding round close Friday, 31 October 2014. For further information contact Bede Martin – bedemartin@xtra.co.nz or 021 230 2908. ANZASW is requesting photos, comments, anecdotes and recollections about people’s past or current involvement in social work and ANZASW to share with our members at the event. Either email brogan@anzasw.org; or post to ANZASW National Office, DX Box WX33484, Christchurch; or courier to Unit C, 375 Main South Road, Hornby, Christchurch. The 2014 report will focus on modifiable risk factors and address topics such as: Developmental Risk Factors, Psychosocial Risk Factors, Lifestyle, Cardiovascular Risk Factors, Public Health Intervention – Learning from other fields. Hear the findings of the report discussed by a panel of speakers from the New Zealand dementia community, including Professor Mark Weatherall, Consultant Geriatrician, University of Otago - Wellington, Catherine Hall, Executive Director of Alzheimers New Zealand and Gráinne Moss, Managing Director, Bupa. Date:Wednesday 17 September 2014, 10am to 11.30am. Location: Small Lecture Theatre, (Level D), University of Otago Wellington, 23A Mein St, Newtown, Wellington. RSVP by 10 September to communications@bupa.co.nz or call 09 985 9704.